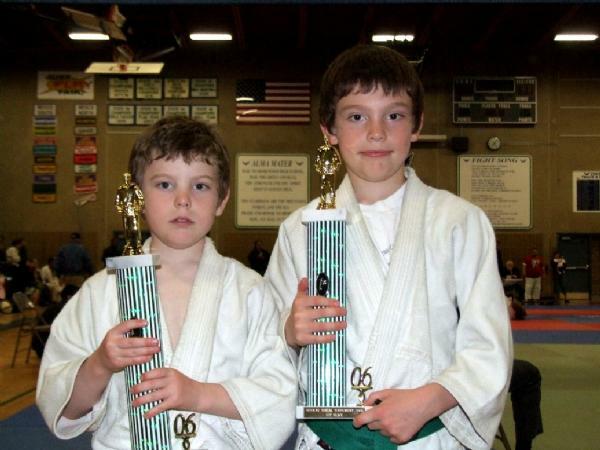 Today I won the WA State Judo Championships. I went 3-0 on the day scoring Ippons in each of my matches. 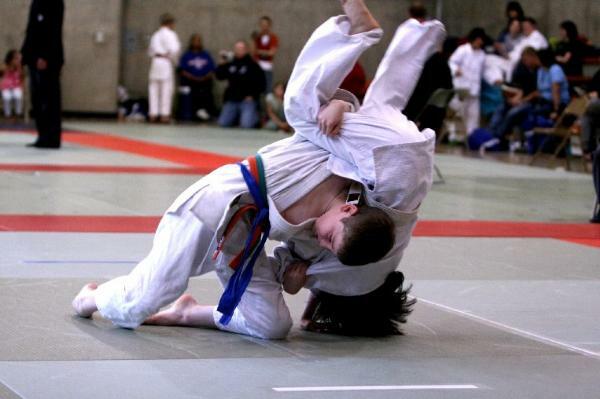 In my first match I won by Ippon with a standing Kata Guruma (above Photo), in by 2nd match I won with a Te Guruma for Ippon and in the finals I won by scoring an Ippon with a rolling Kata Guruma. Today I won my first National Judo Championship. Up to this point I had won 2 silver medals at National Judo Championships, coming close but never being able to win the Gold. Today I was able to win the Gold at Nationals. In doing so I defeated a #1 ranked judo player, a Scholastic National Champion, JR US Open Champion and JR Olympic Champion. 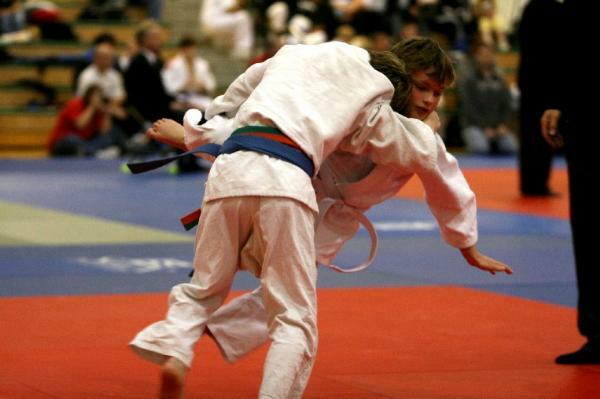 I had a dominant day scoring ippon wins in all my matches but the finals, which I won with 2 yukos and a wazzai. Today I traveled to Canada for the 23rd annual Pacific International Junior Invitational. I won the Gold going 4-0 on the day. Three of my matches I won by Ippon and one by 2 Yukos and a koka. I got my scores with Kata Gurumas, Tae Gurumas and a pin. Today I won my 4th straight Continental Crown. 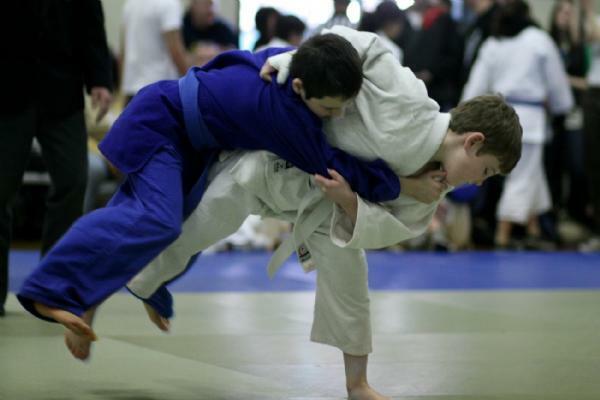 I went 3-0 on the day winning all my matches by ippon. I won the Silver medal this year at Judo Nationals. 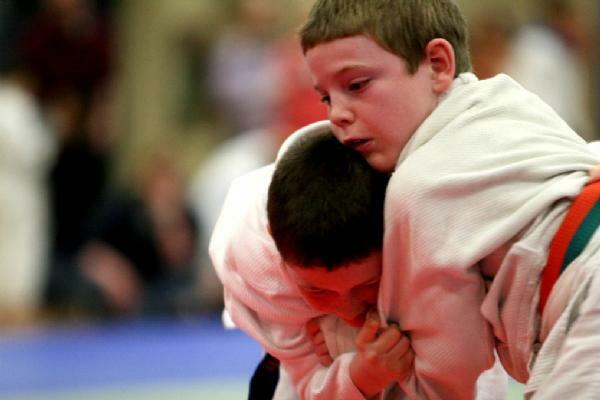 I won my first four matches by Ippon. In my 5th match, I was thrown on the first exchange with a Morote Gari for a Koka then on the 2nd exchange I reached for my opponent, Quinton, and he threw me for Ippon with a drop Seoi. This loss dropped me to fight the winner of the losers’ bracket who I threw for Ippon with a Tai Guruma. With this win I got a chance to take the Gold Medal away from Quinton. I had to defeat him twice in a row. In the first match I threw him twice for kokas and twice for yukos before throwing him again for a koka and transitioning into a pin for the Ippon. I needed one more win. In the final match I threw him for a Yuko early in the match. We battled back and forth for no score into the final minute of the match where I was given a shido for a false attack. With 30 seconds to go I was again hit with a shido for a 2nd false attack allowing Quinton to tie the score. The match ended regulation tied. In golden score, I threw Quinton with a hip throw for what I thought was the win. One corner judge gave me the score. However, the other two judges did not confirm it. I attacked again and was countered by Quinton dropping me to the Silver Medal. 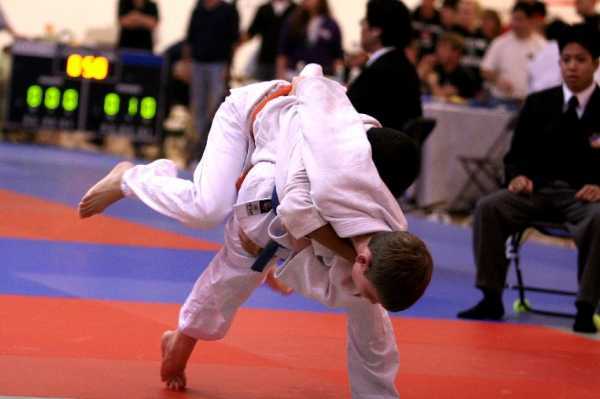 I entered two divisions today and won all of my matches by Ippon. In the finals of my second division I met Brian S. We had a tough match going before I hit him with a drop Seoi for Ippon to get the win. For the 5th Straight year I won the Budokan Tournament. I won all 4 of my matches without giving up any score. In the finals I renewed my rivalry with Brian S. from Bushakan Dojo. 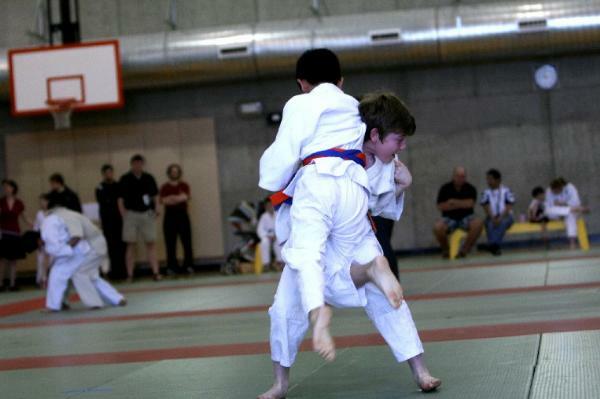 It was a tough match but I finally hit him with a driving Tae Guruma for the Ippon to take 1st place. I only had 2 matches today. I won them both without giving up any score. 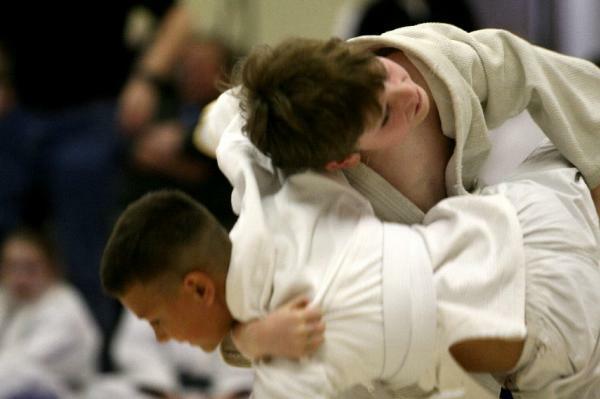 Had my first Judo tournament of the 2008 season today. 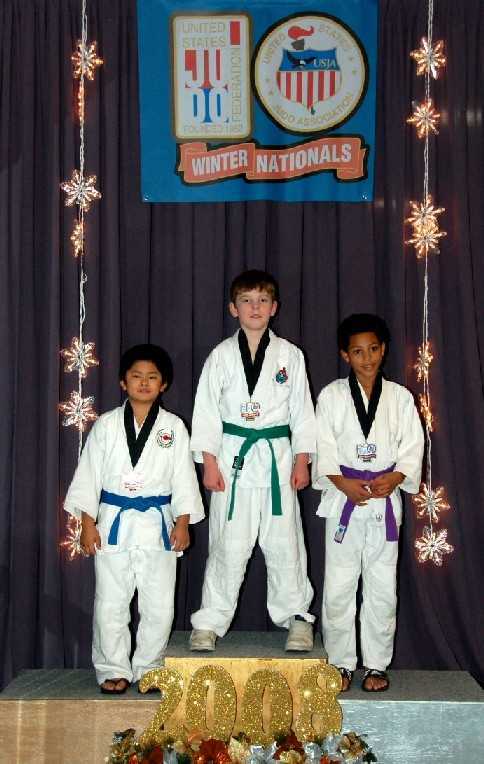 I won all three of my matches by Ippon to take 1st place. For the third straight year I won the Gold medal in the Continental Crown. 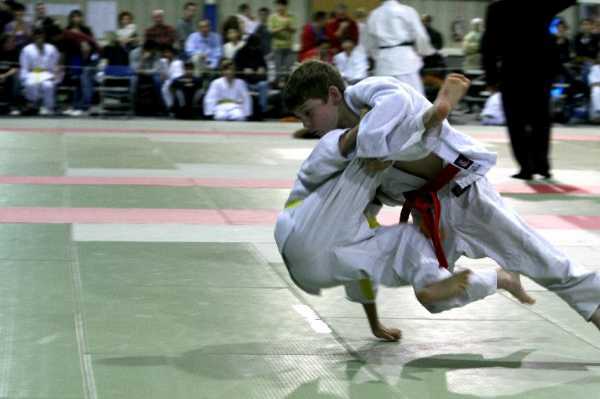 I won my first two matches by Ippon scoring with a Te Guruma in both matches. In the Gold Medal match I was able to win by scoring two kokas and a yuko with another Te Guruma, Drop Seoi-Nage and a hold down. At the British Colombia, Canada Judo Championships I came away with the Silver Medal in 9-10 year 41kg division (I weighed 34kg). After having a bye in round one, I lost a tough match in round two where I was controlling the match until the final seconds when I let my guard down and was hit with a left handed Morote Seoi-Nage for an Ippon. 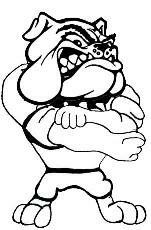 I had another tough match in the next round fighting a much larger opponent. I won the match on a Shido (penalty score) that moved me into the silver medal match that I won by scoring a wazzari countering a forward throw with a Tani-otoshi and a Yuko on a hold down. 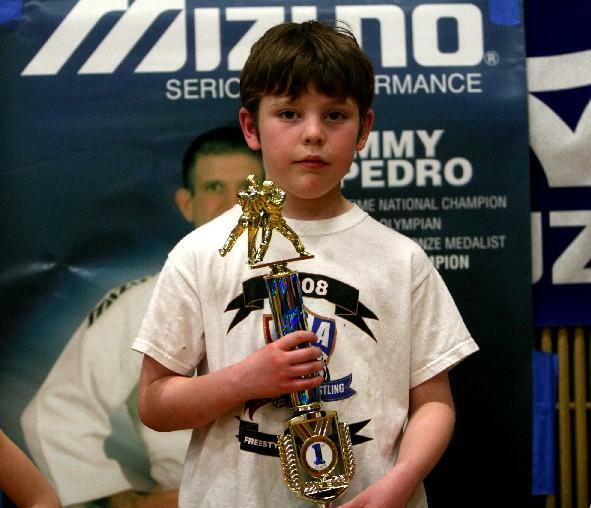 I turned 9 the day before the tournament so I moved up and fought in the 9-10 year old bracket today. In my first match I met Devon (Above Picture). Devon has been winning this division all year. I trained with Devon last summer as we both prepared for nationals. He got the better of me back then. I prepared all week knowing I would have to defeat Devon in order to win today. I came in with a game plan and executed it well scoring a Koka and 2 Wazzaris with drop throws to win the match. In round two I defeated my opponent in the opening seconds with a pick up technique. This was a true double elimination tournament so after Devon won the losers bracket, I met him again. This time I again controlled the match by scoring a Koka on a drop throw followed by a wazzari into a pin for Ippon to win the match and the Gold medal. Next up is the US Open Nationals at the end of July. For the 4th straight year I won the Gold medal in the annual Budokan Judo Tournament. I went 4-0 on the day. In my first match I scored a quick Ippon with a pick up technique. In my second match I again attempted the same pick up that my opponent blocked. I immediately transitioned into a Tai-Otoshi to score an Ippon. In match three I met Gavin, whom I’ve fought many times. I scored a yuko on a pick up followed by a couple other minor scores before I caught him with a leg pick for an Ippon to end the match. 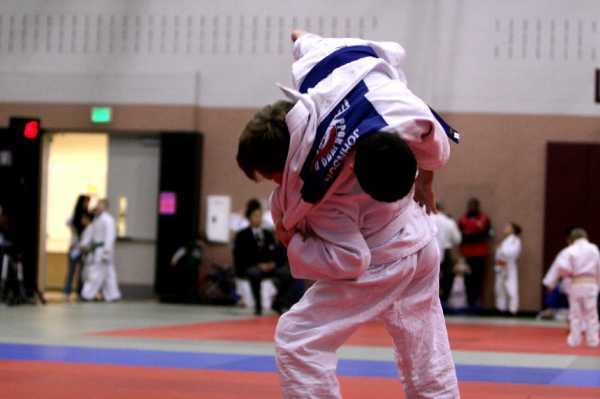 In my final match my opponent attempted a forward throw on me that I countered with an Ura Nage for an Ippon. 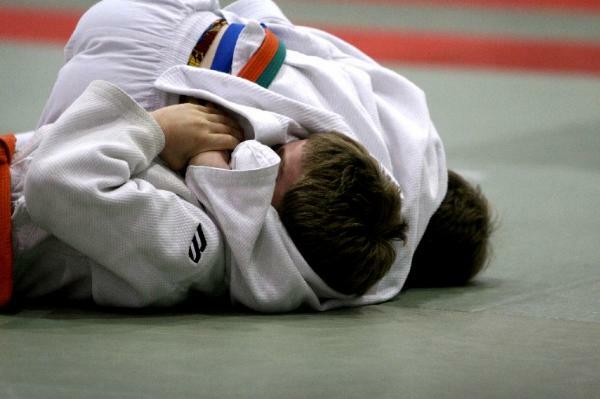 Today I entered my 1st Judo tournament since last November. While I’ve been training judo twice a week since then, wrestling tournaments have caused me to miss all the judo tournaments since last November. I went 4-0 today to win the Gold medal scoring Ippons in all of my matches in quick fashion with a variety of mostly pick-up techniques. For the 2nd year in a row, I won the Gold medal at the Continental Crown. I had four matches today. I won 3 of the matches with a pick up technique in quick fashion and the fourth with a Harai after attempting a pickup technique that was blocked. I had a bye in football this week so I entered the 2006 Rainer cup where I won the Gold medal. I made quick work of each of my 1st two opponents scoring Ippons within seconds of both matches. It took a little longer in my 3rd match as my opponent blocked my throw attempt in the opening seconds of the match. However, I was able to throw my opponent for no score in the 1st 10 seconds of the match and immediately execute a legs in half nelson turn for the pin to end the match. 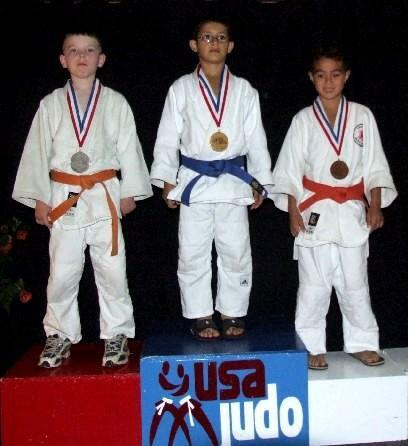 I came away with the Silver Medal competing in my 1st Jr. National Judo Championships. I was very dominant in all of my matches going undefeated in route to winning the “winners” side of the bracket. Along the way, I defeated a 5 time CA. State Champion, Haykaz Oganyan, who according to his coach, had not lost a match in 5 years. Haykaz went on to win the losers side of the bracket. At this tournament, they used a true double elimination meaning that Haykaz, with only one loss, would fight me again and if he could beat me twice in a row, Haykaz would win the Gold. In the 1st rematch, I took and early lead. With about a min remaining in the match, I caught an elbow to my eye as Haykaz tried to counter a throw. After receiving a look by the doctor, the match continued. I was a bit hesitant in my attacks after the hit to my eye. As I went in for a pick up technique, Haykaz was able to counter the attempt and throw me for Ippon to win the match earning another match with me. In the final match to determine the Gold medal winner, I changed up me technique and immediately took Haykaz to his back and held him in a pinning combination. I was unable to hold him long enough to win the match. After a restart, I again attacked but was off on me grip allowing Haykaz to again counter and throw me for an Ippon to win the match dropping me to the Silver Medal. I won the Gold Medal for the 3rd year in the row at this years Budokan Tournament. 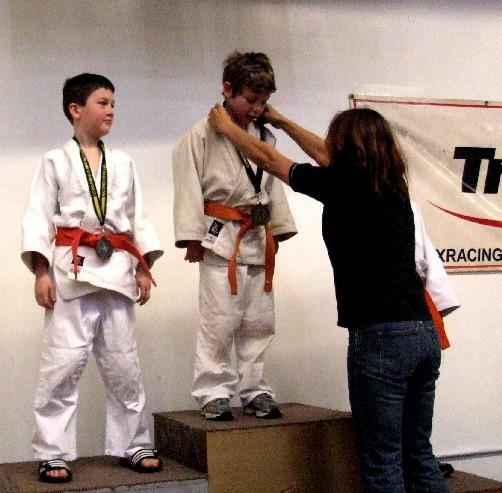 I won the 7-8 year old middleweight division by scoring an Ippon in each of my three matches. I scored with nice pick-up techniques in each of my matches ending each match in less than 15 seconds. I once again met my training partner Garrett in the finals. This time I was able to score an Ippon quickly to end the match. Next up is the Jr National Championships. 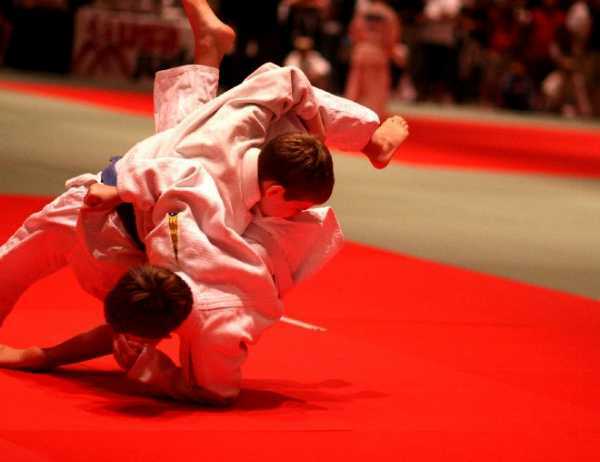 Click here for more on Michael's previous Judo years.